The River Church was like many churches, operating at the end of the life of an aging tech system. A system that likely never lived up to it's hopes even when new. Bose speakers were mounted on the ceiling that had no chance of throwing intelligible sound all the way to the floor. There was an old analog mixing console with no outboard processing to speak of. For video there was an economical approach done some years before, but it was dim and hard to read in this room with so much ambient light. There was no production element to the video, just simple text to the screens. The goals here were to provide clean, energetic sound and powerful video. Because the room was a nice pie-shape design, we designed a mono central cluster speaker system which allowed a nice focused single point of sound to every seat. We installed a pair of Fulcrum DX1295 flown in a cluster. We dropped them from the ceiling just the right amount to be able to cover the seats. We were able to create a forward focus, rather than sound coming from over the worshippers heads. We also installed an Allen & Heath GLD digital mixing system and personal monitors which improved the quality of their mix both to the listener and to the musicians. We also implemented a simple touchscreen controller. 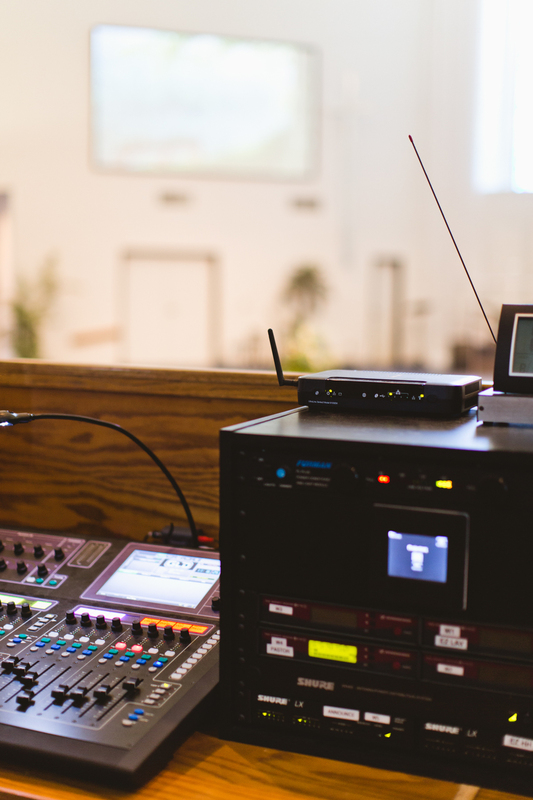 With this unit, lay people can operate a simple service without even using the mixing console. Three microphones and music playback can be all controlled with zero training or tech staff. For video, we installed an all-new Blackmagic production system will full HDSDI infrastructure. New HD cameras were installed and Digital Projection projectors were implemented to provide a stunning end result. The folks at River Church have since returned with a host of stories from the congregation. Those that used to depend on the assisted listening system no longer use it. Those that couldn't read the words on the screens can now see with ease. The turnaround in their presentation has been dramatic. A central speaker cluster hangs above the front of the stage providing perfect clarity. Fill speakers were used to reach the low corners of the room. Mixing is handled not only through the digital console, but in "Easy Mode" small meetings can be mixed with zero skill and no tech staff on the small touch screen. Digital Projection projectors were installed to provide a very bright image on screen even when bright morning light floods in.